WASHINGTON, D.C. – Andrew Whitworth has been named Week 10 NFLPA Community MVP for his charitable work in the wake of the California mass shooting and wildfires. His efforts included donating his game check (approximately $60,000) to the Ventura County Community Foundation’s Conejo Valley Victims Fund and auctioning off his game jersey to benefit the American Red Cross Southern California Wildfire Relief. Both the mass shooting and wildfires hit close to home for Whitworth, whose residence and team’s facilities are located in the communities affected by these tragedies. The 13-year veteran was one of several Rams who were forced to evacuate their homes due to the raging wildfires. Those emotions further motivated Whitworth to do what he has done so often during his NFL career – give back. “Whether it’s giving back financially, extending a hand to those in need or putting a smile on someone’s face, this is what it’s all about,” Whitworth said. 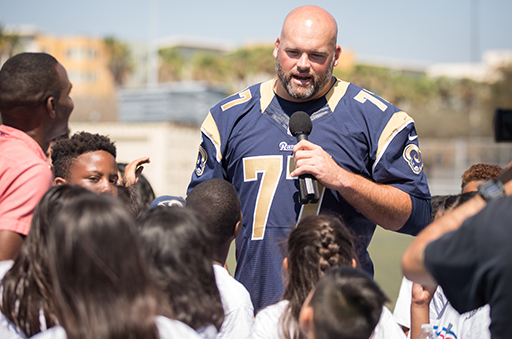 Last season, his first with the Rams, the All-Pro offensive lineman purchased 600 bikes and helmets for Grape Street Elementary students around the holiday season. Whitworth also supported 2017 NFLPA Community MVP Chris Long and his First Quarter Literacy program by matching Long’s donation of $20,000 to provide 10,000 books to Los Angeles kids. Additionally, Whitworth and his wife, Melissa, have impacted youth and families in their home state of Louisiana through various campaigns within the Big Whit 77 Foundation. Whit’s Warriors offers financial assistance to high school seniors in Ouachita and Lincoln parishes, awarding more than $400,000 in scholarships and school supplies since its inception. The foundation’s two other programs are Open Arms, which offers financial assistance to families in the process of adoption, and Wish List, which partners University of Louisiana Monroe and Louisiana Tech athletes with local families for fellowship and fun during the Christmas season. In honor of Whitworth being named this week’s Community MVP, the NFLPA will make a $10,000 contribution to his foundation or charity of choice along with an in-kind donation to him on behalf of our supporting partner Delta Private Jets. A limited-edition bobblehead will also be made of Whitworth and sold by our supporting partner Forever Collectibles at www.sportsfanisland.comand www.foco.com. The NFLPA will donate part of the proceeds from this collector’s item to their charity or foundation of choice. Whitworth, along with the other 2018 Community MVPs, will become eligible for this year’s Alan Page Community Award, which is the highest honor that the NFLPA can bestow upon a player. The NFLPA Community MVP program recognizes NFL players who are making a positive impact in their local communities. Each week during the regular season, the NFLPA will celebrate one NFL player who has demonstrated a commitment to giving back to his community. Please visit our websiteto read more about the program as well as the current and past winners.